The DP301AN-AC is a low-cost, compact 3-1/2 digit panel meter for AC power line monitoring. It uses a half-wave rectifier calibrated to read the RMS value of sinusoidal signals. Two input ranges are jumper-selectable: 50.0 to 199.9 Vac with 100 mV resolution and accuracy optimized for 115 Vac, and 50 to 650V with 1V resolution and accuracy optimized for 230 Vac. The meter fits a standard ¹/8 DIN panel cutout 92 x 45 mm (3.62 x 1.77") and requires a depth of less than 104 mm (4.1") behind the panel. A screw-terminal barrier strip for signal and power is standard. 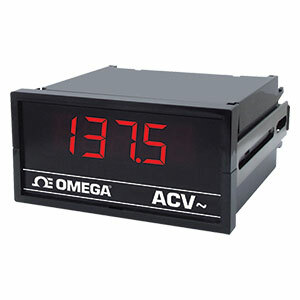 Mechanical options include a board-edge connector display TEST, display HOLD, +4.7V and -4.7V outputs splash-proof lens cover which meets NEMA 4 (IP65) requirement is available for industrial environments. Power options isolated 9 to 32 Vdc and 26 to 56 Vdc.